Ahead of the next round of international talks on Iran’s nuclear program, a senior diplomat outlines Russia’s position on the Iranian settlement. In the run-up the next round of talks between Iran and the international community, represented by the five permanent members of the United Nations Security Council and Germany (the P5+1), Russia’s permanent envoy to international organizations in Vienna, Vladimir Voronkov, spoke with Russian newspaper Kommersant about the potential problems that could derail a comprehensive settlement of the Iranian nuclear problem. Kommersant: Are the Russian and U.S. positions on Iran’s nuclear program more or less the same? Are there any significant differences? Vladimir Voronkov: The Iranian nuclear program is one of those areas where the Russian and U.S. positions match up all the key issues. Like the United States, Russia is categorically opposed to any weakening of the [international] nuclear nonproliferation regime. A nuclear-armed Iran is not an acceptable option for us. But even though we agree with Washington on the most important issues, we disagree with the notion that our cooperation on this track should boil down to ganging up on other countries. Our objective is to make sure, together with the international community, that Iran fully abides with the requirements of international law. That is why we have always opposed unilateral sanctions – because they essentially take the solution of the Iranian problem out of the framework of international law. Kommersant: What do you think Russia’s role should be in achieving a lasting agreement on the Iranian nuclear problem? V.V. : The main objective of the P5+1 group is to put in place all the necessary conditions for formulating the next package of mutual agreements, based on a phased and mutual approach. I can assure you that we are working very hard to achieve that goal. Another task, which is equally as important, is to make sure that the IAEA can play an effective role in verifying [Iran’s nuclear status], based on constructive relations with Iran and in accordance with agreements between the P5+1 and Tehran. At this moment it is safe to say that the agency is working towards that very goal. Vladimir Voronkov: There are plenty of forces in the United States and in Iran that want the pre-Geneva status quo to be restored. Source: ITAR-TASS. Kommersant: Many experts argue that the agreements reached in Geneva last November are very fragile. They say that the deal could break down at any moment. Is that a real risk? V.V. : There are plenty of forces in the United States and in Iran that want the pre-Geneva status quo to be restored. The situation with the Iranian nuclear program, which has now entered a phase of normalization, could certainly become potentially explosive once again. Kommersant: Many in the United States and the EU insist that in the end, Iran must completely abandon its uranium enrichment program. V.V. : It is very important to understand the ideological component of the Iranian approach to nuclear energy. Tehran essentially argues that as a sovereign state, it has an inalienable right to enrich uranium as a matter of principle. That is why all further contacts with Iran must be based on a clear notion that Tehran is not going to forego that right. I actually believe that the right to peaceful enrichment, once confirmed by the international community after the lifting of UN Security Council sanctions, could be a key instrument in overcoming Iran’s proclivity towards self-isolation. If my logic is sound, the P5+1 must move on from its current defensive – or rather, prohibitive stance on Iran; it must take the initiative and engage Iran in cooperative peaceful nuclear activities. 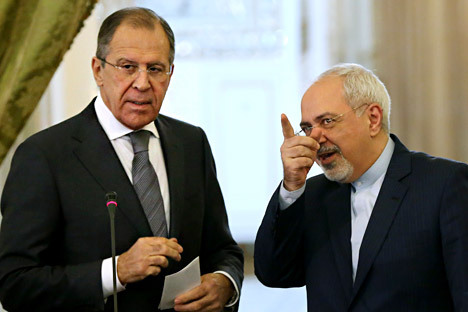 Russia already has a positive experience of international nuclear cooperation on Iran. I am talking about the construction of the first (and so far, the only) Iranian nuclear power plant in Bushehr. Kommersant: The first phase of the settlement includes the gradual lifting of unilateral U.S. and EU sanctions against Iran. When could the UN Security Council sanctions be lifted? V.V. : Speaking about the UN Security Council sanctions, much will depend on when the Security Council can have the IAEA’s conclusion confirming that there is no undeclared nuclear material or undeclared nuclear activities in Iran. Kommersant: Do you think that a lasting settlement of the Iranian nuclear problem is a realistic prospect? V.V. : We already had a realistic chance for a comprehensive settlement in 2005. Incidentally, Iranian President Hassan Rouhani was the chief Iranian negotiator at the time. As we all remember, despite Tehran’s voluntary steps to enact the Additional Protocol to the IAEA Safeguards Agreement and suspend uranium enrichment, the negotiating process was derailed by arguments over the number of centrifuges Iran would be allowed to keep for research purposes. The Iranians had only 12 centrifuges at the time, and they were ready to place them all under stringent IAEA controls – but Washington insisted that Tehran should be allowed to keep only three. Kommersant:: What must be done, and what must be avoided to make sure that past mistakes are not repeated? V.V. : This chance for achieving a lasting settlement must not be squandered. We all need Iran to be predictable, as far as nuclear matters are concerned. So the important thing now is to avoid getting bogged down in horse-trading over technical details. We must ensure a consistent implementation of the steps agreed in Geneva, while at the same time launching a discussion about a lasting and comprehensive settlement. That discussion will not be easy, but I am confident that with sufficient political will, it can be done. This interview originally appeared in Russian here.